Review: The first thing we hear in director Shawn Levy’s ‘Real Steel’ is an acoustic guitar being plucked sentimentally, the kind of music that tells you, before the first lyrics are sung, that it is about a man down on his luck, probably on the road, desperate for a second chance. Which is, of course, exactly what we get. Hugh Jackman is a former boxer eclipsed by the robot fighting craze, but he’s trying to stay in the game with his own machines. He’s not doing particularly well. He also has an eleven-year-old son he’s never met… and you can probably guess where this is going. The boy doesn’t want him, he doesn’t want the boy, and the story is about bringing them together — while they take a unique fighting machine to international stardom. With its diverse team of producers, a couple story-by credits and a usually terrifying partially-inspired-by credit, it’s clear that this is a movie that was made by committee. It’s cheese, fluff, and big CGI robots beating the crud out of each other. A story this thoroughly soaked in sentimentalism and the mush of recycled pop culture should be so rote and manufactured that it fails to achieve a modicum of emotional impact. But that’s not the case; just because it is an exercise in efficient Hollywood money-making does not mean it is fundamentally wrong or, for that matter, ineffective. Levy and company employ an army of clichés that prove their familiar power; there will be slow-motion, there will be last stands, there will be unlikely heroes, and somehow there will still be tears in the audience. Hell, I cried, and I knew exactly what they were doing in a cool, objective way. This is a film that blatantly mashes up giant robots with ‘Rocky’ and dares you to sneer at it. It’s like a cinematic staring contest; whose eyes will get watery first? Let this serve as an important reminder: originality is not King — truth is. Well-worn clichés persist because of their inherent value, and when communicated through good performances and rousing sequences, they can reach the most cynical of viewers. The fights are the heart and soul of this film, even more so than the dramatic beats in between. They are tense, exciting, well-photographed, and always character driven. There are no superfluous action sequences. I will call them good, certainly, but I will not call them great. Like so many other postmodern films, ‘Real Steel’ succumbs to an excess of cuts and angles, which results in frequent disorientation and intermittent suspense. The cinematography and editing outshine most other contemporary action films, but are still hamstrung by an underlining impatience. Quick editing is powerful in small doses, while in large amounts it is simply wearying. Slow motion is not an acceptable respite, either, as in effect the pace only slows about two to four seconds per shot, and while it highlights emotion, it does not balance out the marathon tempo of a given scene. Here’s a simple slice of cinematic theory: The longer the take, the longer the characters live and breathe in the frame, the suspense persists, and the action plays. In short, more bang for your buck, all because you didn’t cut to camera B until another five to ten seconds had passed. Say you’ve got your robot hero enduring punches thrown by his opponent, and you want to emphasize the assault’s punishing duration. Don’t cut to a “more intense” angle or return to a reaction shot more than once or twice, the bare minimum necessary to set up an emotional relationship between your characters in the moment. Stay focused. We should endure the assault along with our hero, as long as it takes. Therefore, when he finally ducks a blow and hits his opponent square in the jaw, the reversal’s impact is substantially heightened. Save the quick cuts for the quick changes. For example, say the robot combatants are tangling back and forth, only keeping the upper hand for split second intervals. Use quick cuts to mirror the choppy nature of the battle. A filmmaker who perfectly fits their visual progression to the story’s events (i.e., cause and effect from moment to moment) is a perfect filmmaker. Lastly, I’d like to consider the ideas the exist in the film’s text and subtext. I think, if ‘Real Steel’ is successful (and it deserves to be), there is room to explore these notions in a respectable sequel. Centrally, the robots serve as avatars, helping humans achieve emotional catharsis through violence. Both Jackman’s character, and his son, express themselves through the robot called Atom, who can learn any movement he sees performed by a human being. This relationship is what makes the finale so powerful, and ultimately justifies ‘Real Steel’ to me. Indeed, the last shot is of the machine mimicking the boy and his father simultaneously — he’s the synergistic bridge between the two, where their souls meet and act as one. He may also be a self-aware A.I. ; if he is, then that has terrific implications for the robot boxing enterprise. 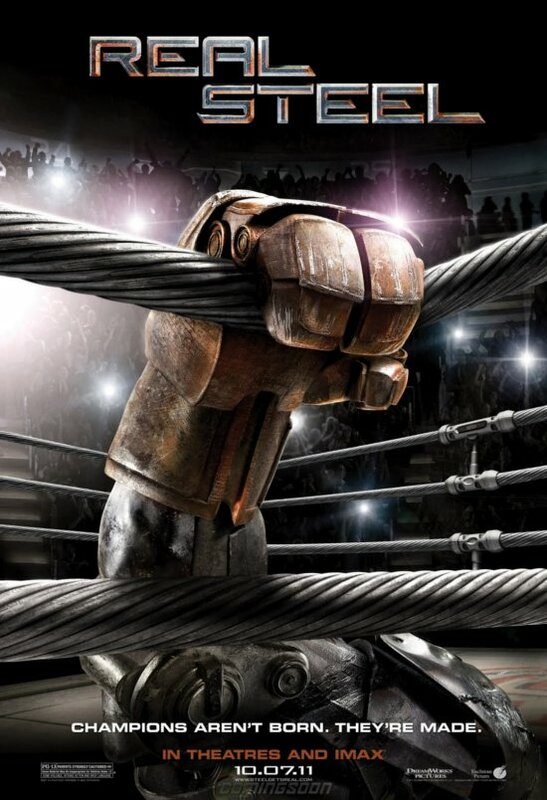 If a boxing robot’s nature is that of an avatar, could it choose what person to represent? What if a boxing robot wished only to represent itself? I won’t suggest that the filmmakers should tread down the familiar path of the robot uprising. ‘Real Steel’ should be limited to explorations of its peculiar territory, nothing more or less. In conclusion, I can say that ‘Real Steel’ is a solid work of genre filmmaking for a wide audience. It’s a movie that young boys will drag their parents to see, but I don’t think that anyone in attendance — provided they are not hopelessly jaded — will remain unaffected. It’s not a film geared toward (snobbish) cinephiles such as myself, but I recognize that good, comfortable narratives like this are why many people go to the movies at all. In IMAX, ‘Real Steel’ has all the rumble of a roller coaster, and it is in that spectacular format that I would recommend you to experience this sentimental, rousing, bubblegum, two-fisted, populist dreck.